I love lists of all kinds. To do lists, lists of things you like, you name it. Anything, as long as it’s in list format! And I love these type of fill in the blank lists – I wish that those books you had as a kid where you got all your friends to fill in all their information was still a thing. I’d make heaps more friends just so I could fill in more of them! Luckily, I have a blog, so I don’t need friends. 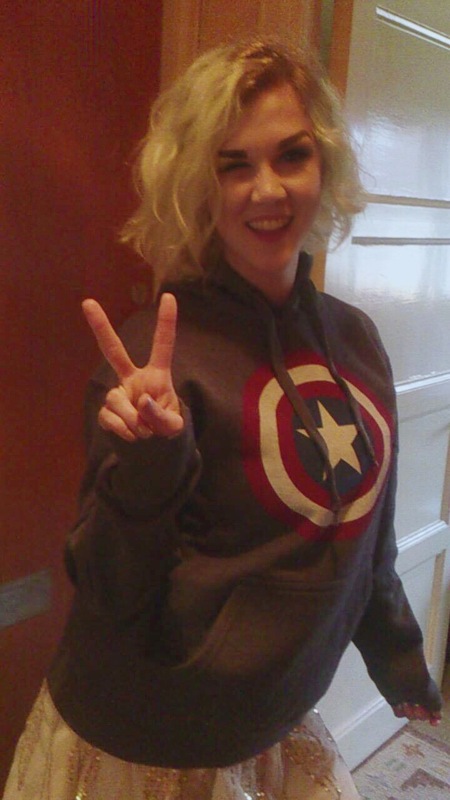 My super awesome Captain America Hoodie that my dad gave me for Christmas! I don’t really wear hoodies out of the house but I love this one and it’s so cozy that I’ve been wearing it every single second that I’m at home since I got it. Unfortunately my dad’s camera is a bit of a potato, but I think its beauty shines through. I’m good! I’ve got plans for all weekend, I’m just getting ready for work and I’m feeling pretty chill. I’m wishing that all my plans for the next six months fall into place properly, and that I can manage to hit my savings goal first of all. Two bowls of cereal and a Red Bull. Breakfast of champions! My friends are having a house party so I’m going over to theirs. No one really. Maybe my mum, but I know I won’t see her until April anyway so that’s more abstract and not really at the forefront of my mind. 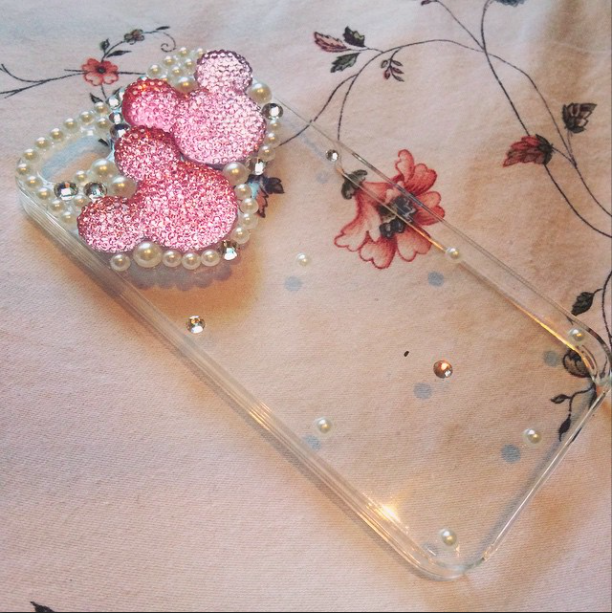 I bought a phone cover with two pink, sparkly Mickey Mouse heads on it! Probably something stupid that I saw online, I can’t actually remember. Last thing you cried at? When watching Catching Fire last night, the scene where Mags walks into the poisonous fog just completely broke me and I had to pause the film and sob for a few minutes. Old women in movies always remind me of my grandmothers and how much I miss them both. Last person you fell asleep with? Nothing! I have several books I want to read – I got the Casual Vacancy for Christmas (side note: they should probably forcibly remove my dark mark tattoo for being such a bad fan, having not read this book before), and I also have the Curious Incident of the Dog in the Nighttime waiting for me, but I can’t decide which one to go with first. Catching Fire. I went to see Mockingjay with a friend last weekend, and I felt a bit silly that I hadn’t watched the previous two. I’ve read the books, but that was at least two years ago, so I decided to watch the first two for a refresher. They’re pretty intense! What’s your most frequently used swear word? Probably the c word or the f word. I swear a lot! I’d like to think I can gauge what is or isn’t an appropriate time for it, though. The Captain! I haven’t spoken to her in ages, because our schedules don’t match at all, being that she’s in China and studying hard. We spoke for a bit over half an hour and hopefully it won’t be two months until the next time again! What did the last text you sent say? Watermelon! I love it. I especially love watermelon juice – you don’t even have to chew it, it’s just instant heaven. Which celebrities have you been compared to? Marilyn Monroe, Madonna, Rita Ora, Courtney Love. Anyone who’s blonde and has short hair! Death, that someone I love will die before I get a chance to see them one last time, the dark and anything you could potentially find in it. Not really. If I’m with someone and they’re giving me reason to be jealous, then… I’d rather just let them go. They can have whomever it is they’re flirting with, and I don’t have to deal with the headache. Your favourite character from a TV show? Um. I don’t watch a lot of TV nowadays, but I think maybe Margaery Tyrell from Game of Thrones. Mostly because I have a crush on Nathalie Dormer. Who was the last person who wrote to you in the Facebook chat? Eva! I’m counting it as texting though because the difference is minimal nowadays. Most recently, French. I did get an account on Duolingo and everything, but I haven’t been keeping up with it like I should. Australia! I juuuuust got my visa, and after the weekend I’ll buy my tickets! And my other goal is, like so many people, to get back in shape. I haven’t done any hoops in months! Which is really sad, because I still love it and I want to keep doing it and keep improving. Specifically, by April 30th this year I want to be able to do five chin ups and a muscle up invert!